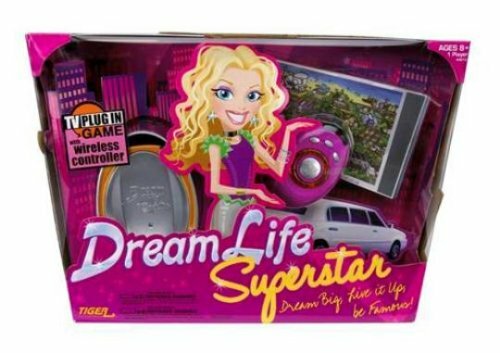 The Hasbro dream-life TV plug-in game turns every youngster into a super-star. Ideal for children ages 8 and up, this interactive game allows children to embark on a fabulous adventure as a celebrity. Dream Life takes place over a virtual summer vacation and provides kids with hours of entertainment. Easy Setup and Control: Dream Life Superstar plugs right into a TV's audio-visual inputs. 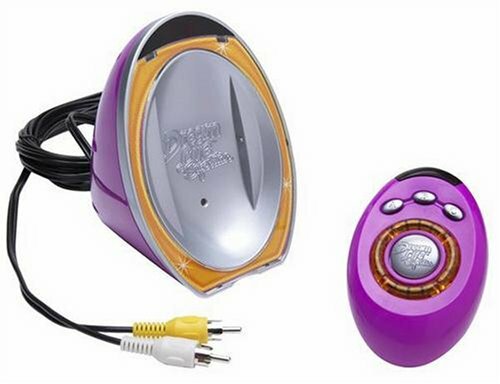 It comes with its own purple wireless remote control and an instruction booklet. Just plug the game console into the TV, grab the remote, and you're ready for action. Plus, the Dream Life game is easy to transport. When it's time to pack it up, children can save their game and take it to a friend's house or start over and create an entirely new celebrity. Adventures on the Red Carpet: Dream Life allows players to visit a fantasy world only experienced by the rich and famous. The player can be an actress, singer, TV star, writer, or athlete and the longer they play the more activities and jobs there are to choose from. The character visits celebrity hangouts including the sound studio, red carpet, and spa. As the celebrities enjoy their new-found success, gifts start to arrive, including fan letters, special-events invites, and more. Additional games are unlocked as the player progresses for endless entertainment opportunities. There are a wide variety of looks, clothes, and activities to experiment with. Dream Life creates a glamorous world where every kid can feel like a superstar. This product requires four AA and two AAA batteries (not included).